1. If you experienced a crash or other abnormal behavior, please attach the log file 'beaTunes-logs-2019-02-10-071127.zip' by dragging it from your desktop onto the 'Attach File' button below. 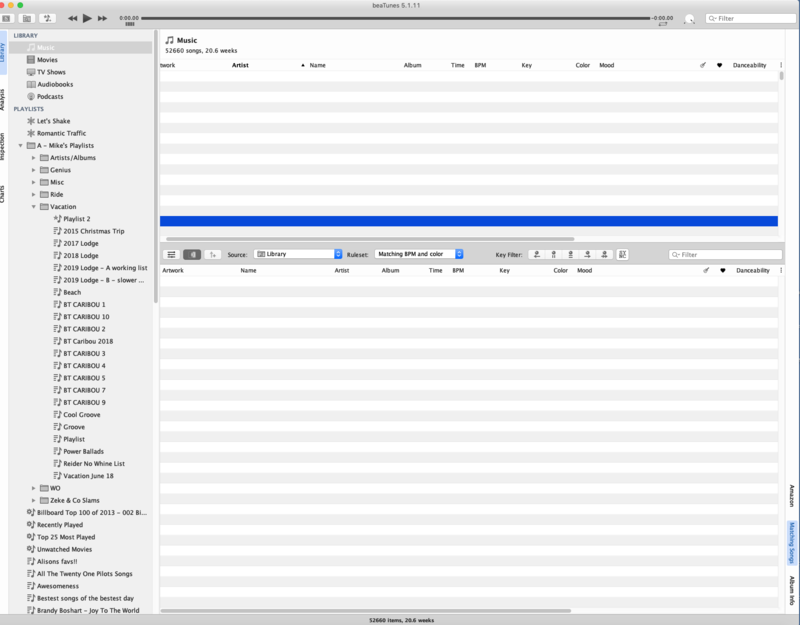 I've recently updated to 5.1.11 and it is terribly slow to load up the library or playlist. See attached screenshots. The library and playlist shows number of songs at the top but the list doesn't show up. I'm at the point that I'd like to return to my previous version. Also, have you tried Tools -> Repair Database? If not, please give that a shot. I tried checking my backup for the previous version but it doesn’t go back far enough. I’ve been trying to avoid a rebuild as it takes days to complete. everything in this version seems to slow or non-responsive. 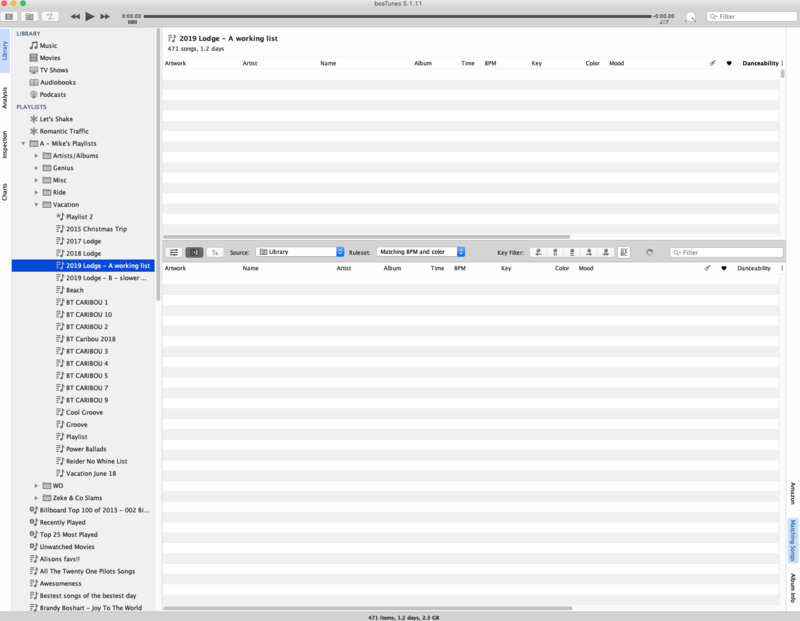 creating a new matchlist or playlist from selection used to be almost instantaneous. Just now i tried and the runtime execution popped up. I will try a rebuild and report back. I’ve been trying to avoid a rebuild as it takes days to complete. Please try repair, not rebuild. Those are two very different options. 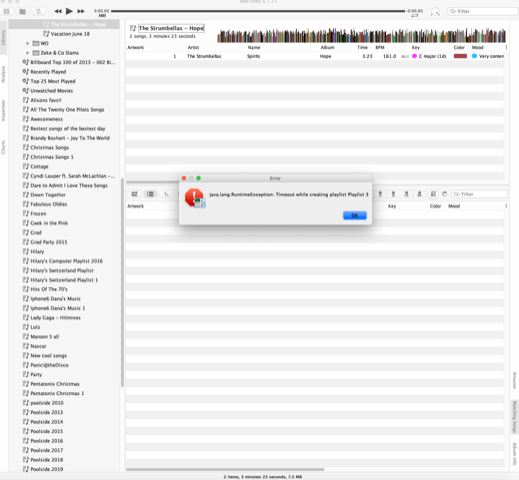 While repair only rebuilds the database tables and indices without reading any data from your audio files, rebuild deletes the whole database and then re-reads all the data it can find from your audio files. The latter takes much longer. A repair should be reasonably quick. But should the repair fail, something is seriously wrong with the internal database and I would recommend a rebuild anyway. I tried checking my backup for the previous version but it doesn’t go back far enough. Does that mean, you don't know what version you updated from? I can tell that you have attached a screenshot with some error message, but the resolution is too bad for me to be able to read the message. good tip…i’ll try reading more carefully next time. thanks! No worries. You're in good company. Most people don't realize there's a difference. Repair completed. It still takes several minutes to populate the library or playlist listing. version: correct, I don’t recall what my previous version was. I updated just before Christmas but my oldest time machine backup is late January. error msg screenshot: java.lang.runtimeexception: timeout while creating playlist playlist 3 - i had tried to make a playlist from a selection. I realized that you have sent logs before—those were from beaTunes 5.1.5. So we are not talking about a major version update (4->5), but only the last digit in that number (micro version). I took a look at the log files you sent and it seems like beaTunes is very busy trying to get recommendations from Amazon. Unfortunately, the log does not contain all information I'd like to see. Then please use the snapshot for a bit, play around and reproduce the issues you experienced. Then please send me a new set of logs. Also: Do you have media key support turned on or off? I highly recommend turning it off, should it be on. Hope fully new logs help me work out, why beaTunes is not as quick as it should be. Thanks Hendrik. I will give this a try. Would you please direct me to the media key support control? I’m not sure if it’s on or off. I’m not sure where to look. Would you please direct me to the media key support control? It's in the playback preferences. Current log is attached. I’ve also uploaded the logs through the help pulldown. Sorting the main table by PlayFrequency is unfortunately slow, because it's hard to precompute the index—that's because PlayFrequency is fairly dynamic. It always reflects the situation now. I recommend avoiding it, unless you really need it. Using the Amazon similarity rule is always fairly slow, because you have to connect to Amazon and query their service. There is an issue with that, probably caused by Amazon or too many requests I still have to look into. But for now, if you don't really need it, I recommend disabling that matching rule. That said, you might get better results by using the US store (configurable in the general preferences). Matching with similar genre should be faster. I have updated the code a bit to make it more efficient. Please download, install https://www.beatunes.com/download/beaTunes-5-1-12-SNAPSHOT.dmg (same URL as before, but different file now), and play around with it. I.e. create some match lists using the genre rule. Please let me know, how that goes, preferably also upload a fresh log via the Help menu. Thanks and have a great Sunday! Thanks again for the help Hendrik. The items you highlight below were not set by me. I haven’t changed any settings for sorting, Amazon, etc. It must have loaded this by default. Which ruleset do you use for match lists or the matching song table? You can check in the song matching preferences. I went back to your logs and you seem to have the Amazon Similarity rule enabled (song matching) as well as similar genre. But regard PlayFrequency you are absolutely right. I'll look into that. I just wondered, have you ever had a chance to try out the snapshot I posted on 2/17? I haven’t much time to play with it but it seems that everything drags/takes longer to do anything. Earlier version(s) i’ve worked with would work much faster. also, previous version i never had to do any changes for amazon, or anything else. attached the log file and uploaded them to server too.